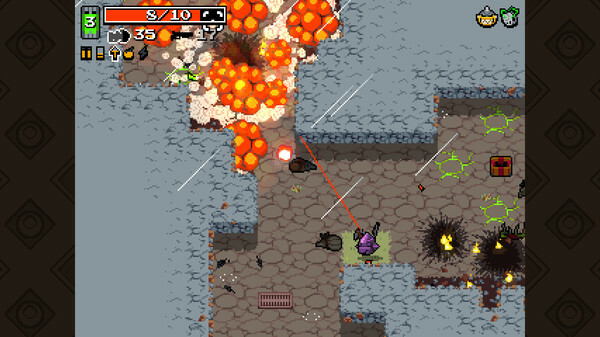 I landed on the twin-stick, roguelike shooter Nuclear Throne. A former early access game by Clamber, the critically acclaimed indie title has you taking control of one of a cavalcade of mutated freaks and monsters as you try to blast your way through dozens of disfigured enemies to reach your ultimate goal, the Nuclear Throne. There is no story. No character motivations. Only pure gameplay. For what seems like a tiny game, there is a surprising amount of content packed inside. Dozens of different weapons centered around five basic types that all play slightly differently, a well thought out upgrade system for your character, and a variety of distinct enemies leave you with enough meat to dig into for a while. And most importantly of all, it controls very well. Every time that I died, it was my fault. Maybe I was too close to an exploding enemy. Or I backed myself into a corner. I ran out of ammo or overextended my reach for a pickup. I couldn’t blame the game when I died. My frustration was on me. I can’t count the number of times I found myself cursing while I hit retry, being put immediately back into the game. They perfected the feedback loop, taking a page out of the book of games like Super Meat Boy or Trials. When you die, there is no lengthy animation. Just an option to choose whether to go back to the main menu, or rely with the same character and settings. And I died a lot, so having this little hook dangling in front of me to pull me back into the game caught me many times, pulling me back in for “just one more quick run”. The downside of this formula is that a perfect run quickly took shape in my mind. Which upgrades to get and prioritize. Which character to use for optimal survivability. Which weapons to try to obtain. If you managed to get lucky and roll the right things, a run could be successful. But sometimes, those dice rolls simply didn’t go in your favor, and you quickly found yourself waiting to die sot that you could try again. It kept me coming back for more and more, and I easily found myself dumping hours of my time into this simple game. I’m glad I finally came around to it, but I might have chosen a bad place to start my journey through my backlog. It makes me want to play more of this game as opposed to actually going through my unplayed games. Which is hardly a bad thing.